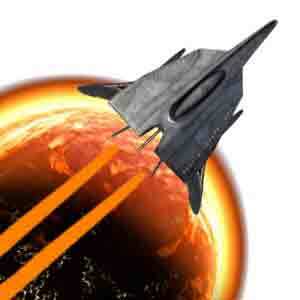 Launch into space and get ready for this challenging shooter game featuring HD graphics and realistic sound effects. Inspired by classic arcarde-style games like Gradius, Ikaruga, and R-Type, All My Enemies takes you on a journey that's out of this world, spanning six different planets and a dozen levels. Are you ready to conquer the final frontier? "My dear servant, I, your Emperor, have strict orders for you. You must finish all opposition to my power, you must destroy all my enemies." Your goal in All My Enemies is to embark on an action-adventure mission to defeat the enemies of your Emperor. Dodge asteroids and fire at enemy craft while gaining experience, collecting gold, and obtaining power-ups to unleash more extreme firepower. Use your skills to play through all 12 levels across six planets, while firing at wave after wave of enemy ships and advancing to take down six different final bosses. Climb your local leaderboard or take a stab at advancing through the ranks on the integrated Scoreloop leaderboards, which feature separate leaderboards for each of the three difficulty levels in All My Enemies. All My Enemies offers a variety of ways to play to ensure you have a great gameplay experience. When starting a new game, players can select Modern times mode, which delivers continuous play, but takes away the weapons you've gained after conquering each planet. Otherwise, choose Old school mode, which will restart the level when you are killed; however, you get to maintain your weapons after each planet. Choose wisely! Under game Options, you can adjust game controls and choose to play with Touch or Tilt Control, including a tilt calibration tool to match your device's capabilities. If HD graphics tend to slow down your device, you can adjust the quality to maintain performance. There is even support for players who have a Zeemote joystick game controller for mobile devices. As is typical, you can also turn the music and sound off.